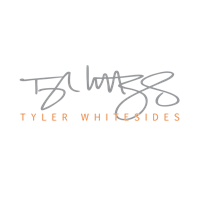 Tyler Whitesides was born in Washington state. The youngest of five siblings, he was raised in northern Utah where he still resides. Tyler spent much of his childhood outdoors, exploring the mountains near his house, and imagining many adventures with his neighborhood friends. He developed a love of books from a very young age, and with that came a desire to write his own stories. 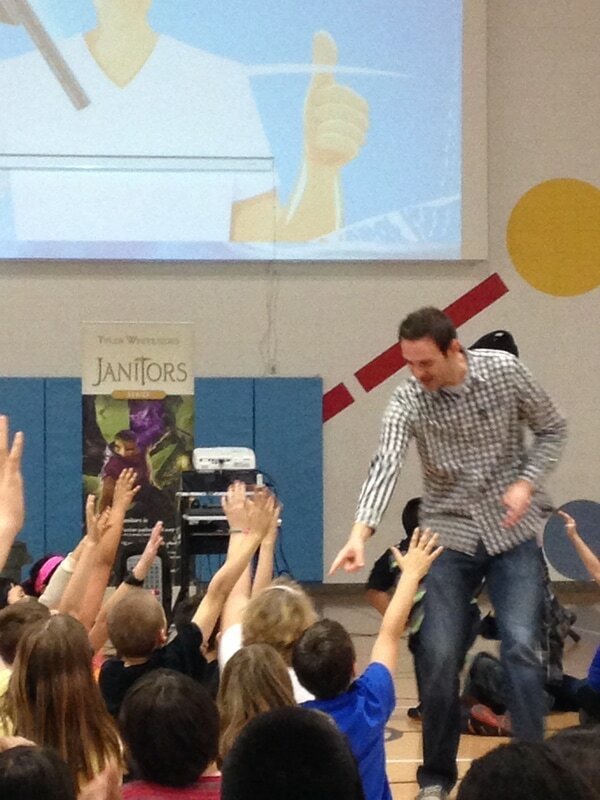 In middle school, Tyler joined the school band and began learning to play percussion instruments. He had many opportunities to perform on stage as a soloist with concert bands and orchestras, as well as rehearsing and performing some of his own compositions. After high school, Tyler spent two years in Argentina where he learned to speak Spanish. Upon returning home, Tyler attended Utah State University, where he received a Bachelors in Music, specifically, Percussion Performance. 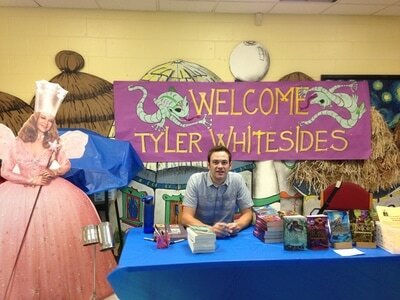 While attending the University, Tyler got a part time job at a middle school as a night custodian. Wandering the halls of the middle school each night sparked the ideas which eventually led to the JANITORS series. 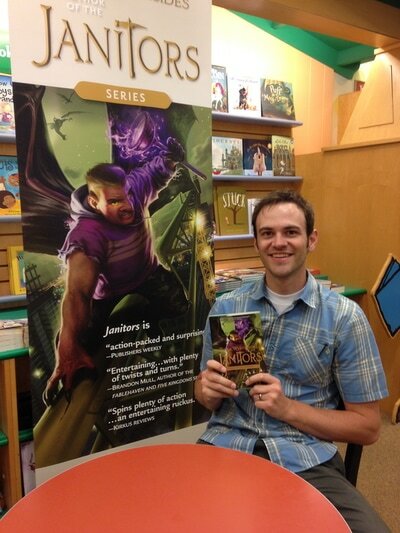 Tyler wrote the first draft of JANITORS in 2009, and after connecting with his first agent, Rubin Pfeffer, landed the series at Shadow Mountain Publishing. 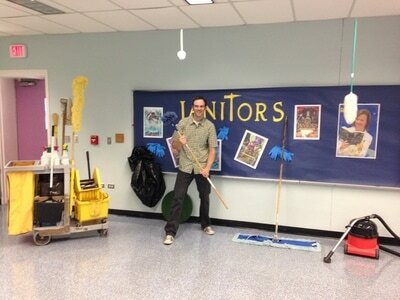 JANITORS was published in 2011. 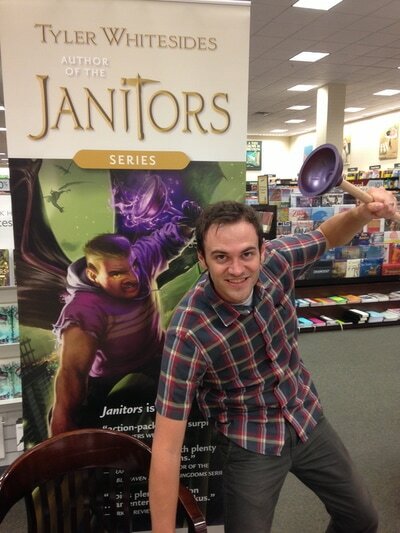 Over the next five years, the JANITORS series was developed and published, with the fifth and final book hitting shelves in 2015. During the course of the series, Tyler had the opportunity to visit many states, presenting at more than 600 schools across the country. He is now represented by Ammi-Joan Paquette of Erin Murphy Literary Agency. Tyler lives in Northern Utah with his wife, Connie, and their son. Tyler still enjoys spending time outdoors, fly fishing mountain streams, and exploring nature. He continues to practice percussion, performing in a garbage-can drum quartet aptly called, The Jammin’ Janitors. Tyler also enjoys acting and singing, performing musicals with local theater companies. But most of the time, you’ll find him hard at work on the thing he loves most – writing!